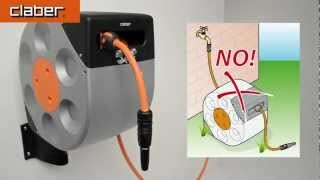 The original design and technology automatic hose reel, innovative in its convenience and safe use thanks to the smooth winding hose and the internal Soft Block® System, which guarantees perfect winding every time and automatically stops the hose should it slip out of your hand. Made with sturdy materials and featuring a silver finish to match modern tastes, Rotoroll is the ideal solution for a patio or a small garden, thanks also to the 180° rotating wall bracket. Hose reel with automatic rewind and exclusive Soft Block® System mechanism for safe and dependable use. Ready to use. Has 20m special hose with non-kink wall and antifriction surface, ensuring faultless rewind action (no jamming, no breaks). Made from materials resistant to impact and strong sunlight, guaranteeing maximum durability over time. FRP wall bracket with stainless aluminium pivot allows the reel to swing through 180°, ensuring the hose will always run straight and unrestricted in the direction of use. Supplied with extension hose (2m.) and ¾” tap connector, quick-click automatic fittings and spray lance. Complete with screws and masonry plugs for wall mounting.